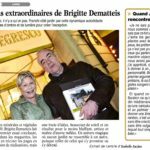 AccueilNews|PressBrigitte Dematteis : Draw a garden for me ! A garden on the Riviera becomes a room to be lived in, a place where the family can be together on the freshly mown lawn, near the poll and the scent of jasmine, next to the pergola and magnolia. Big or small, a Mediterranean garden is best created, imagined, designed by a professional to avoid mistakes. Brigitte Dematteis has made the happiness of her customers her credo to make the most of the gardens entrusted to her. » The owners were preparing to move into an apartment from a beautiful villa, surrounded by a beautiful outdoor area with magnificent views of the Mediterranean. I suggested removing the grass around the pool and the front of the house, creating beds and bringing colour and life to the garden » says » says this passionate gardener. How long have you been doing this job ? I started 25 years ago a bit by chance, because I was good at drawing and being a child of the country, I knew loved Mediterranean plants. My first and best memory is a garden of two and a half hectares in the Grasse hinterland. It had the charm of simplicity and beauty. In fact, this one was exceptional for a first work. It turns out that after that I went through a period where my creations were more loaded. Creating a garden can be compared to creating an artistic work. With time one learns to purify, to keep the lines right and pure like Matisse at the end of his life. The more you learn, the more you do it. Tell us a bit about this garden where you wanted to meet ? It’s true, the owners of the property were wanting to sell up. They’d had enough trying to keep the garden looking good. They’d spent 20,000 euros on the lawn which was pointless. So, I got rid of the lawn and offered various alternatives suitable for the climate in this bit of Mougins, and for the look, the type of soil and the client’s budget. Look how surprising the result is with its shades of green in perfect harmony. All these shades of green blend into beautiful bushes.A well-built garden is made for 20 or 30 years without having to redo it. This initial investment saves a lot of money in maintenance because I avoid errors. You’ve written several books ? Yes, I realised a fex years ago that I wanted to share beautiful things. Beautiful with a capital B. Talking about four exceptional Mediterranean gardens that I have created and a two hectare one which is quite sublime, I must say. The second concerned the design around outdoor area around an old farmhouse, it is charming, and the third, mine, surrounds my house in Cabris. It is built like a painting with lights, surprising shadows. The fourth is Terre Blanche, a very nice private garden too. And your second book ? I am proud of the foreword by Alain Baraton, architect responsible for Versailles Palace park. This book is called « From Art to Garden Architecture « (2015). In this one I present a more technical approach of my view of shapes and volumes. I describe in a way « my method ». Alain Baraton compares me to Saint- Exupery because I don’t draw sheep, but gardens that resemble the people who will live there. And your third book ? This is a very small book for very small gardens. My belief is that beautiful landscapes are not reserved for an elite. I can create a garden that is out of the ordinary adapted to the client’s budget. I want to make my job more democratic whilst conserving an ethical approach and maintaining quality. It’s the passion that inhabits me and with passion, we achieve great things ! Emotion should invade the whole garden and the soul of this garden is born of this emotion shared by the customer.